A group of Clancy & Theys employees teamed up with Warwick Mechanical Group last week to assist in hurricane relief efforts. In September, Hurricane Florence wreaked havoc across the Carolinas, causing widespread destruction, flooding and power outages. The storm poured historic amounts of rain on the Carolinas, dumping more than 30 inches in some areas. 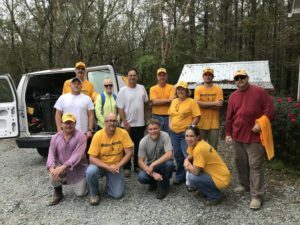 The team traveled to Rocky Point, North Carolina, where they partnered with Baptists on Mission, a group spearheading long‐term recovery efforts at 14 large recovery sites across North Carolina. At each recovery site, teams work on mud‐outs, tear‐outs, shockwave/sanitation and putting tarps on roofs. So far, over 3,800 Hurricane Florence recovery jobs have been completed by Baptists on Mission recovery groups, but more than 2,000 jobs still remain incomplete. The group anticipates full recovery efforts to take 2‐3 years and to require thousands of volunteers to help get families back into their homes. As always, Clancy & Theys strives to better the communities in which we live and work by lending a helping hand wherever we can. Our thoughts are with the Carolinas and Hurricane Florence victims as they continue to weather the lingering effects of this storm.